VoLTE (Voice over LTE) differs from traditional circuit-switched voice in a variety of ways. 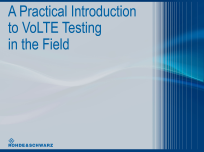 This webinar provides field engineers with a practical overview of the most important issues in the testing and troubleshooting of VoLTE networks. Real-world examples taken from live networks will be used to provide practical advice for testing and troubleshooting VoLTE in the field.